The collections were discovered during the relocation of the Museum’s collections' storage in January 2011. These artefacts offered us the opportunity to go back to our roots in European archaeology, and we couldn’t resist the chance to further study the collection. Little did we know, that our knowledge of Middle Eastern archaeology was going to come in very handy. There have been numerous twists and turns to this mystery and the story behind these collections has turned out to be far more exciting than we ever thought! Click here to see a video entitled, "Hidden Histories: Why You Should Always Dig a Little Deeper!" 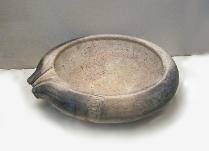 Example of a complete mortarium (mortar). These were used along with a pestle in food preparation.